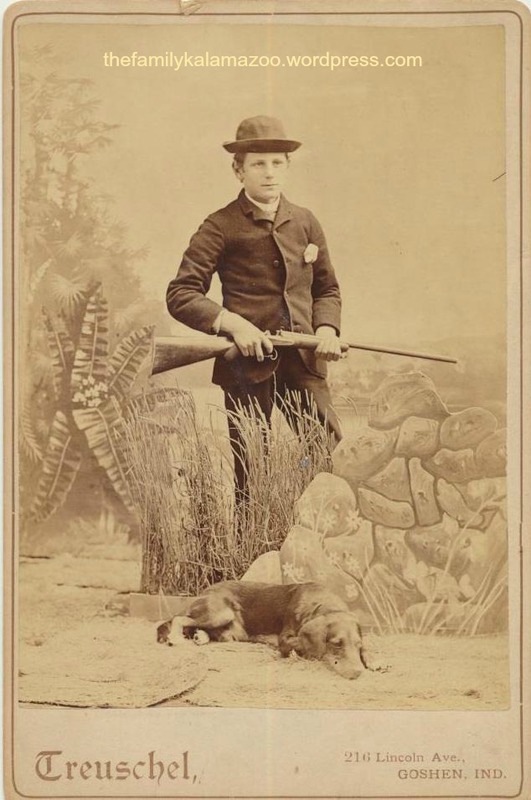 My last post was about the Todds–a family that, unfortunately, I am not related to ;). One last thing about them. My mother-in-law, an artist, painted the Todd House for a man named Paul H. Todd in 1970. So I did a little research. Paul H. Todd was one of the sons of Albert May Todd, the founder of the A.M. Todd Company. He, and his brother Albert J., both served as mayors and city commissioners of Kalamazoo. Paul’s son, Paul H. Todd, Jr., later filled his seat in Congress from 1965 to 1967. Which Paul Todd did my MIL paint for? In the 1960 city directory, Paul Jr. lived at 3713 West Main Street. His business was the Kalamazoo Spice Extraction Company (now called Kalsec). Paul Sr.’s business was Farmer’s Chemical Company. He lived at 3715 West Main Street. Next door neighbors! Paul Sr. was born around 1884, so he would have been around 76 years old in 1960. Ten years later, Paul Sr. would have been 86. So I asked my husband. He says the Paul Todd who commissioned the painting was middle-aged, so it must have been Paul Jr. Searching a little farther, it appears that Paul Sr. died in 1969. On the bottom right corner of this print (because I only have a print, of course), my MIL wrote that this building was Paul Todd’s house (but is that possible? ), and that it was located on the corner of Kalamazoo and Rose Streets. I found the intersection of W. Kalamazoo and N. Rose on Google Maps. The building is no longer there. It seems likely that, in 1970, the business was operated in this inner city area, but that the family didn’t live there. Nevertheless, in a family discussion, others thought that Mr. Todd lived in the same building that the company was operated from. 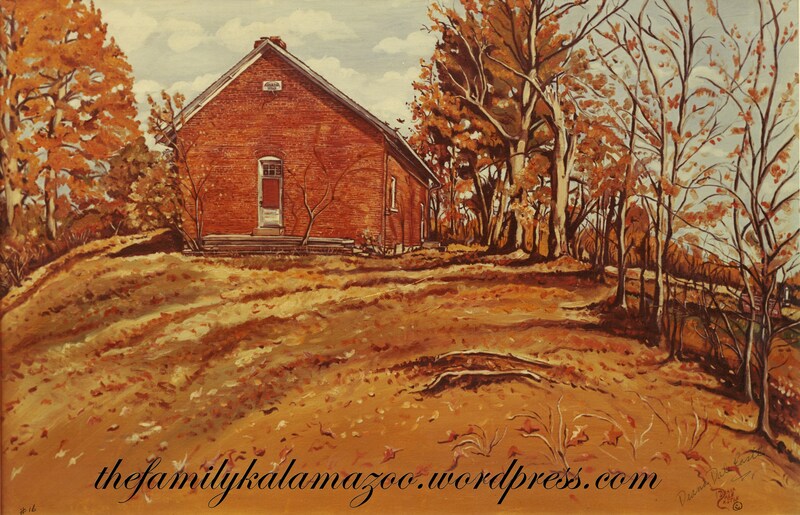 Back to my MIL’s paintings: she painted many locations in the Kalamazoo area. Here is another one she painted in the very early 70s. It’s known as the Gourdneck Prairie-Webber Schoolhouse, Schoolcraft Township. It still stands today. Here is a link to check it out. I posted a copy of a graduation announcement last week. I didn’t know who it belonged to, but it turns out it belonged to Uncle Joe DeKorn. A reader posted a link to the answer. It turns out that Uncle Joe graduated from Kalamazoo High School in a class of 26. One of his classmates was an Upjohn son, William Harold Upjohn, and one was a Todd daughter, Ethel May Todd. When Uncle Lou (Lambertus) Leeuwenhoek passed away on April 20, 1949, another Todd–Mary Todd–sent flowers and a sympathy notecard. You can read about Uncle Lou and his wife, my Aunt Jen, if you click on the following links: a post about Uncle Lou’s hero brother who died at war, a post about Uncle Lou’s Bible collection, and one which focuses on my Aunt Jen, Uncle Lou’s wife. When I was growing up, she was the oldest person I knew. A post I still need to write is about the store Uncle Lou and Aunt Jen owned. I don’t know how Aunt Jen knew Mary Todd, but maybe it was at church or maybe it was through the store. 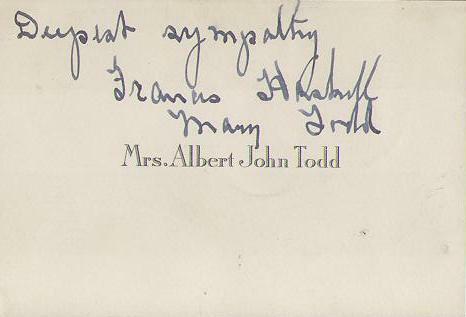 Mary Todd was Ethel’s sister-in-law, the wife of Albert John Todd, the President of the A.M. Todd Company. Mary’s husband was a son of the company founder. In 1950, Albert and Mary lived at 2344 Midvale Terrace in Kalamazoo. The house was in the middle of a section known as Westnedge Hill, where the houses are all large and custom and the lots large for city lots. The 1920 census indicates that Albert and Mary lived with their four children and two servants, an “Englishman” and a local girl. According to the 1930 census, they had one servant, a different girl from ten years earlier. It’s hard to tell about the 1940 census because Albert and Mary are at the bottom of the page, and I am not sure how to find the next page. Any ideas? Quality. Purity. Integrity. 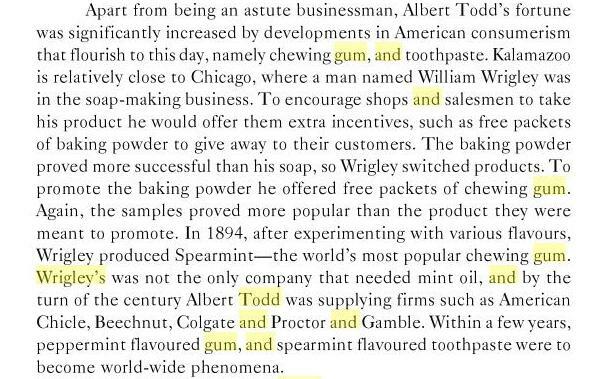 An unwavering belief in these principles inspired Albert May Todd, then a teenager, to found A. M. Todd Company in 1869. It was an era when mint essential oil from Michigan had a poor reputation thanks to widespread adulteration by unscrupulous vendors. Albert May’s initiatives brought credibility to Michigan essential oils and early success to the A. M. Todd Company, now the world’s oldest and largest supplier of American peppermint and spearmint oil. Maybe Uncle Lou and Aunt Jen were customers, through their store, of the A.M. Todd Company. This company was sold a little over two years ago. You can find an article here which describes the company, the sale, and the influence of the company on the Kalamazoo area. Notice that the notecard also has the name Frances Haskell. Maybe that indicates that the flowers were, in fact, from women who knew Aunt Jen through a women’s group? Frances Haskell seems to be a middle-aged single daughter of Gertrude Haskell. 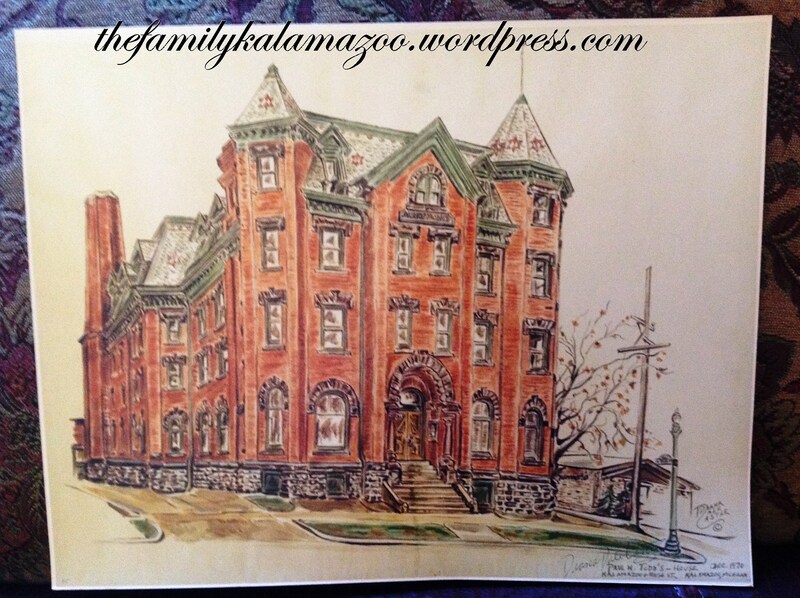 The Haskells lived in the beautiful area near Kalamazoo College and the Henderson Castle. Once again, this item and the information I’ve found leads to more questions than I had originally! Remember that genealogy research “to do” list I made back in December? Good, I’ll forget about it, too. I’ve been so busy at work lately that I am behind in everything. But readers are so helpful, that I will post something that is a bit of a mystery to me (what isn’t?!). 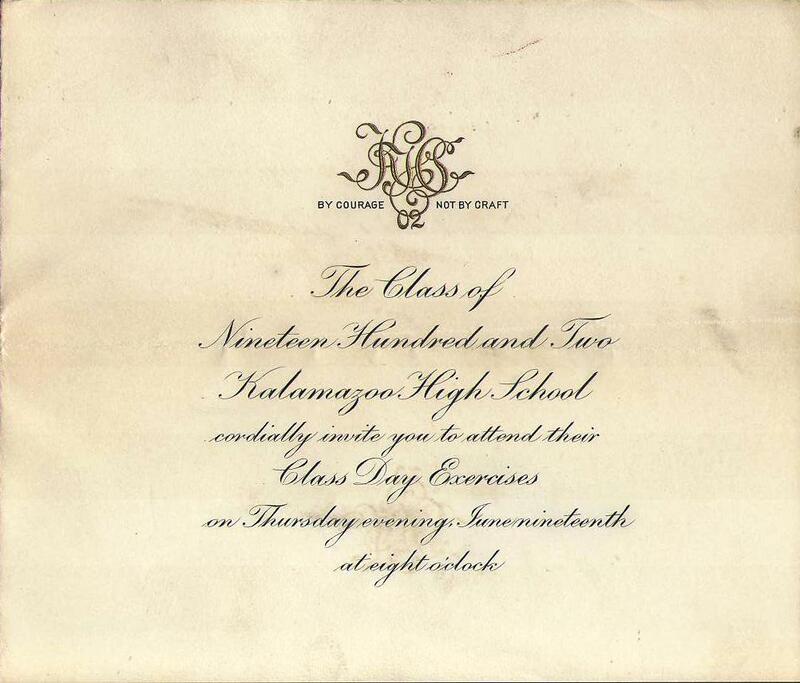 This “Class Day Exercises” announcement for the Kalamazoo High School Class of 1902 was with some other papers and clippings my grandparents held for years. But who did it originally belong to? Who in the family graduated from high school in 1902? My first guess was Joseph DeKorn because he seemed about the right age. Joseph Peter DeKorn: June 30, 1881. Look at that! He was born under the astrological sign of Cancer, just like me. How old would he have been in 1902? My advanced math skills tell me he would have been 21. Hmm, that seems a little old for graduating from high school. Especially for a very smart young man like Uncle Joe. Grandpa wasn’t born until 1908. I wondered about Alice Leeuwenhoek, but she was born in 1897. 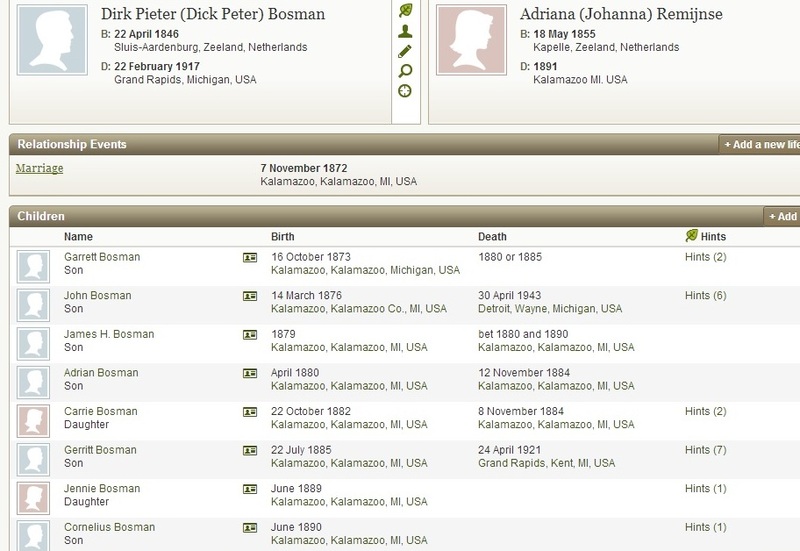 The daughters of Richard DeKorn’s second wife were born in the 1890s, as well. The first VanLiere boy wasn’t born until 1902 (in Goes, the Netherlands). It is possible that it could belong to a child of Mary DeKorn DeSmit and John DeSmit, but that seems unlikely. It could have belonged to a friend, but then why would the family have held onto it all these years? Any ideas on how I get a list of 1902 graduates of Kalamazoo High School from the comfort of my computer chair? Another thing I wonder about is exactly what Class Day Exercises are. I believe they are still held today, but what role does it play in the graduation process that includes commencement, baccalaureate service, etc.? Do You Remember The Mystery of Mrs. Jacob Flipse?